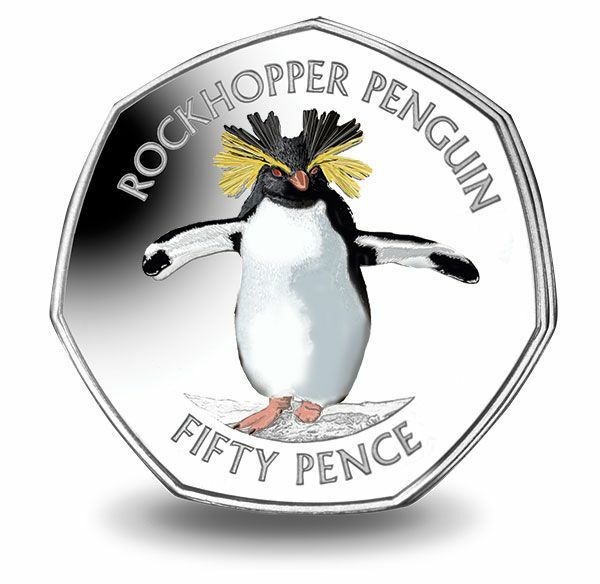 A new series of coloured fifty pence have been struck for the island that refers to itself as the penguin capital of the world. It has now been nearly ten years since Pobjoy Mint started striking currency for the Falkland Islands and felt they needed to do something special to mark this occasion. A quirky penguin with itâs black and yellow spiky plume, red eyes and pink webbed feet, his wings are raised ready to hop. The Gentoo, King and Magellanic will be released throughout 2017 and to keep your penguins safe there is also a delightful collectorâs pack to unite the set. These uncirculated cupro nickel diamond finish fifty pence have a low mintage of just 7,500 and with the prices of the I.O.M. fifty pences now commanding Â£100 plus, may be this might be a set for the future. The Southern Rockhopper, a quirky penguin with itâs signature hairstyle, black and yellow spiky plume, red eyes and pink webbed feet, his wings are raised ready to hop straight into your collection. The Gentoo, King and Magellanic will be released throughout 2017 and to keep your penguins safe there is also a delightful collectorâs pack to unite the set. These uncirculated cupro nickel diamond finish fifty pence have a low mintage of just 7,500. The Gentoo Penguin is the second penguin to be released in this very popular fifty pence series, struck for the Falkland Islands by Pobjoy Mint. The reverse features an adult Gentoo Penguin cuddled up with its two chicks, sitting on a rocky mountain outcrop where they like to nest. This penguin is renowned for its waddle and sweeping tail that moves side to side when it walks. These uncirculated cupro nickel diamond finish fifty pence have a low mintage of just 7,500.